My favorite time of year is fall, when the air turns crisp and our focus is on raking leaves, cutting back perennials, and putting our gardens to bed. But I like to keep an eye on the spring by planning and selecting which flowering bulbs I want to appear after the dreary winter months. Nothing says spring and rejuvenation quite like springtime bulbs, and with a little planning and foresight you can have a real splash of color in your garden starting as early as February. The most important thing to start with is high-quality, healthy bulbs. These types of bulbs are not usually found in the large box stores. We purchase bulbs for our clients from Colorblends, located in Bridgeport, CT. You can view their bulb varieties as a non-landscape professional on their website: www.springdisplays.com. We highly recommend perusing their website and signing up for their mailing catalog so you can plan well in advance. A few factors come in to play when you’re planning where to plant bulbs. The first is light; bulbs need six (6) hours of sunlight per day – any less and they’ll be weak and thin, and may not bloom after the first year. Bulbs also need well-drained soil, or they’ll rot. Another factor is the flowering period. You can create a great show by selecting bulbs with different flowering times, but make sure you don’t plant them behind large perennials that leaf out and hide the display. With thoughtful bulb placement, you can have a garden that pops when the rest of nature is just getting started. The most frequent question we get from our clients is how many bulbs do I plant? That surely depends on your budget, and how much time you want to dedicate to planting. The biggest mistake homeowners tend to make is to plant too few bulbs, and place them too far apart. We love to have a dazzling visual impact, so we plant more bulbs than one would think. We plant in groups of 8 or 10 bulbs per hole, or dig trenches and line them with hundreds. Even if you’re only putting a few bulbs in the ground, group them together for maximum impact. The bulb planting on the left doesn’t have the same impact as the planting below, but would if all of the bulbs on the left were planted in two large groups on either side of the entry steps. These bulbs were planted by digging a trench, placing the bulbs about four inches apart, and covering the trench with soil. The spring display is lovely, and continues for several weeks. We took this chart straight out of our Colorblends catalog, and we think it’s a good place to start when determining how many bulbs you’ll need. We often plant tighter than this for maximum impact. Not sure of the square footage of your garden or how to calculate it? 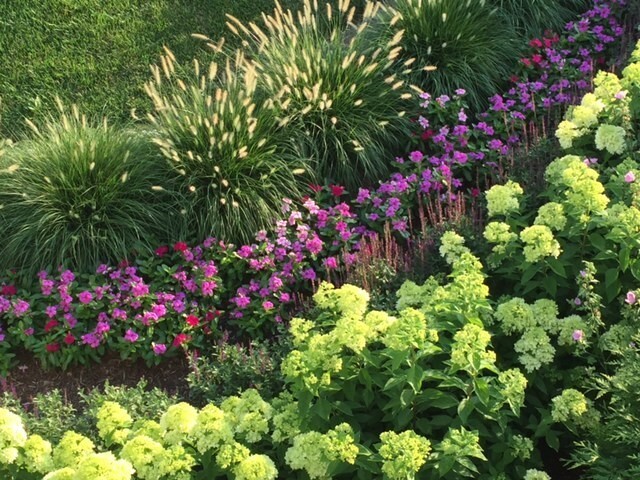 The best bet would be to call us and sit down with our Landscape Designer, Pat Lammers, and talk it through with her. She has some ideas that can really make your springtime garden sing, and will have the neighbors talking about your garden all season long. One of Pat’s ideas is to plant two types of bulbs on top of each other in the same bed. Plant smaller bulbs such as crocus on top of larger bulbs, like tulips. Dig the bed to the depth for the larger bulbs. Plant those bulbs and cover with a thin layer of soil. Place the smaller bulbs on top of that and cover with soil. It sounds tricky, but it can be done, and you’ll have a longer flowering period. Remember, crocus are the first bulbs to pop and signal the start of the flowering season. Another important fact to consider is that after your bulbs have finished blooming, the foliage has to remain intact for several weeks, to "ripen" and pull enough nutrients into the bulb for next year's flowering. Cutting the foliage down, tying it with rubber bands or braiding it hampers the flow of food and water to the bulb. The best solution is to place your bulbs in a spot where the ripening foliage will be hidden by emerging grasses, perennials or annuals. In the photo to the right (taken in July), the bulb foliage is camouflaged by 'Hameln' grasses and annual Vinca. Sometimes you don’t have the energy or time to plant fall bulbs; it’s a busy season for just about everyone. Not to worry -- call Pat and she can design the placement of your bulbs in the garden, and have our crews out there planting before you can say Fall Bulb Planting! Come Spring you won’t regret your decision, and when the neighbors ask make sure you pass our name along. Happy planting!